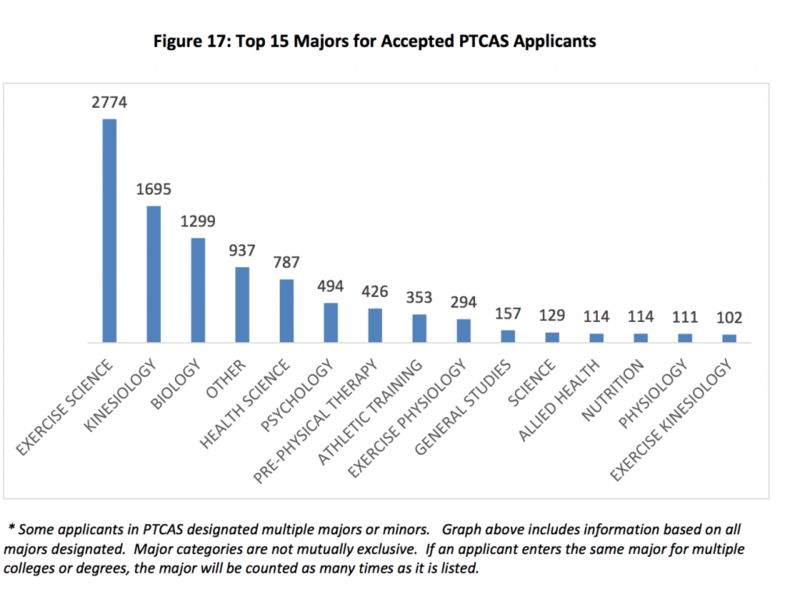 If you’re trying to decide on the best physical therapy major if you want to become a PT, you’re not alone. Over 19,000 soon to be PT School applicants this year have asked the same question. The real question is this: does your undergrad degree matter when applying to PT School? Personally, I had a bachelors in business and an MBA before I applied to PT School. That doesn’t fit the mold at all! Here’s my impression on undergrad degrees and Physical Therapy: Your major matters less than what you think it does. 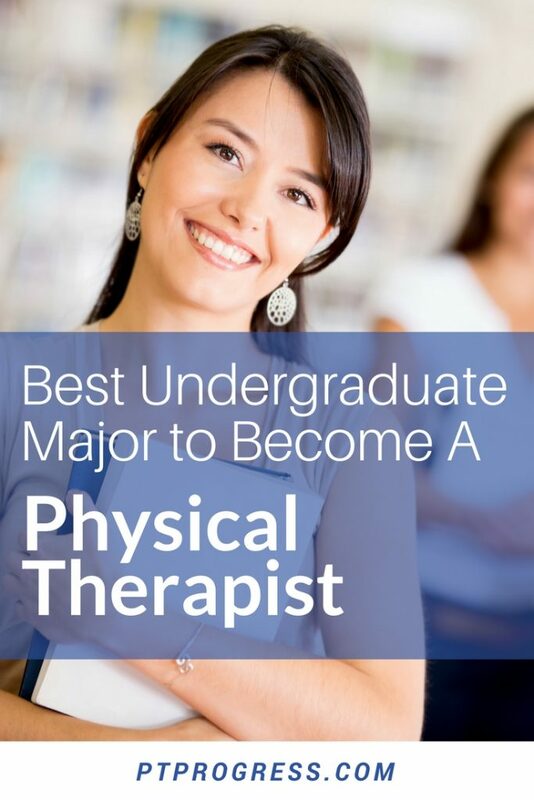 If you want to become a PT, there isn’t a “physical therapy major” option for your undergrad. You must complete certain pre-requisites, but your undergrad degree or major can be in anything you choose. The actual physical therapy degree is what you earn when you graduate from PT school (graduate level program). Most of the PrePT programs will offer options to complete a bachelor degree in exercise science, human biology, or even kinesiology. Those programs will generally satisfy the prerequisites for PT school but don’t necessarily mean you have a better chance of getting in or even succeeding in PT school. What to major in for Physical Therapy? Think about it another way: these degrees will give you a glimpse into human movement and will give you more background in terms of the biological processes of the body, but you won’t be set apart from everyone else. You will be surrounded by other students with a degree in kinesiology or biology, applying for the same PT School seat you want! Now consider someone with a degree in engineering, marketing, or teaching. They bring unique experiences and different thought processes to the table. They’ve completed the same prerequisites as the kinesiology major, but during their PT school interview, they discuss how their training in teaching will help them in the clinic to educate patients on improving their motion or with progressing exercises. There are a number of ways to promote yourself when you have a different degree than the average PT applicant. In my opinion, there are three key benefits to having a non-science degree when you’re applying to become a PT (or any health profession for that matter). You bring a unique perspective, new skills, and a different way of thinking to the field. You give yourself options to pursue work outside of your field if you change your mind after completing a degree in Physical Therapy. So What are the Best College Majors for Physical Therapy? The top majors accepted into Physical Therapy School is actually published by the APTA. Here’s a look at the top 15 undergraduate majors for Physical Therapy school. At the end of the day, your undergraduate degree will not get you into PT school. They are looking for someone who is willing to put in a lot of hard work to learn the skills, but also someone who can connect well with people. As a Physical Therapist, you educate your patients, engineer solutions to home setups, create marketing plans for your clinic, and balance the budget as a clinic manager. Having a degree outside of Biology will certainly work in your favor. What degree are you considering before applying to PT School? I am an aspirant for MS in Exercise Science or Kinesiology and going to join it by Summer 2019. After completing my MS in Exercise Science or Kinesiology and also after clearing a US Licence exam as a physical therapist do I need to do DPT to practise in USA? Hi, I have a BA in Business Management since 2007 and I am thinking of a career change to Physical therapy. What would be the best way to get into the field? Would I just need to do pre-requisites and then be able to go straight to the Master’s program and complete 3years or how does that work? I currently live in Florida. Would I be able to work while studying? hello iam an under board PT 1996 in philippines, really long years passed and for sure lots of changes in modalities, and everything , How can I be updated again with the course, do I have to start first until intership, im planning to take Pjilippines board again , but afraid because I am OUTDATED ALREADY. i dont know what the best collage would be to major in this, i’m going to millitary school mid-may and will graduate at 16, my parents want me to go to UGA to cheer for the bulldogs but i want to go to dallas. Hello I graduated high school in 2015 and did a year of community and technical college (1ctc) I enjoyed taking Anatomy and Physiology 1 and 2. I moved to a different state and started some online courses that fell through in 2016. Then I went to a 4 year university as a PHYSICS EDUCATION MAJOR fall of 2017 and left in the spring 2018. Now I am at (2ctc) I will be 22 when I graduate with my A.S. this spring 2019. I applied to my PTA program. should I go to the military and have them pay for my school and work there for the rest of my life? I really want to get my DPT but I was shy about it and didnt know if my major mattered. Now I am willing to do whatever it takes. Hi im a senior in highscool. What major do you think would be best for me to have to get in DPT? I saw that excersice science is a popular one. Do they mostly want people w excercise science degrees? or it would be better for me to do a degree not everyone does?